The Mississippi Gulf Coast Aerospace Center at GPT is located in Gulfport, Mississippi (Harrison County). The site is owned by the Gulfport-Biloxi International Airport and is comprised of 241 developable acres adjacent to the airport’s 9,000 ft runway. Located approximately two miles from the Port of Gulfport/the Gulf of Mexico and three miles from Interstate 10, the site has access to rail service and is currently available for lease. This site also provides easy access to the Gulf of Mexico flight testing range. 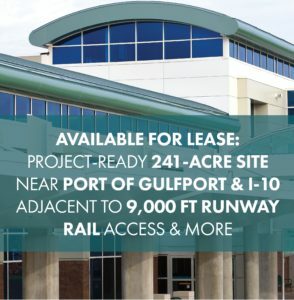 To view more available sites, amenities and opportunities at Gulfport-Biloxi International Airport, download our full economic development packet.